As a member of the National Trust, you’ll receive a heartfelt ‘thank you’ three times a year. Our members’ new magazine TRUST – full of great stories and beautiful photographs – is delivered straight to your door. We hope it will help you get more from your visits to our places and an increased awareness and appreciation of Australia’s heritage. To tell you more here’s a special message from our Editor-in-chief Victoria Carey. 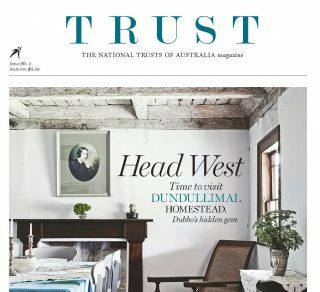 “WELCOME to the first issue of TRUST, a magazine devised to tell you about the wonderful work the National Trusts of Australia does around the country — we hope these pages increase your awareness and understanding of Australia’s heritage and lead to a commitment to it. And there are so many good stories to tell. From Andrew Batt-Rawden’s stay at Gallop House as composer in residence to the fight to preserve Windsor’s Thompson Square, they all reveal just how important the National Trust of Australia is to our cultural life. There have been many highlights in this first issue. Who knew that Dame Enid Muriel Lyons loved to do her own wallpapering? We discover her domestic side at Home Hill in Tasmania’s Devonport on page 34 (and I’m still wondering how this accomplished woman managed to have 12 children and become the first woman in the House of Representatives). But perhaps my favourite is At Home: Modern Australian Design, an exhibition of contemporary furniture at our oldest surviving public building, Parramatta’s Old Government House. The power of that juxtaposition of history and modernity is reminiscent of Milan Design Week and it’s a refreshing way of looking at our permanent collections. We want as many people as possible to enjoy TRUST so we’re making the first two editions available in a digital format. However, if you’re not already a member and want to experience the real thing and all the benefits membership brings then join as now for as little as $65* a year. You can purchase TRUST for $8.95 at our properties** or at the National Trust Shop online. Be aware there are limited copies available. *A one off membership fee applies. Individual Membership cost quoted. ** Not all National Trust properties may have TRUST available for sale.